Ideal for variable winds and normal family use. Do not use in winds over 15mph. Minimum of 90 HP boat required. Offers brisk takeoffs and slower descents. Ideal for larger family members. Minimum of 90 HP boat required. All Workshop Parasailing equipment uses Sun Fast, Silicone Coated Rip Stop Nylon, All Stainless Steel Hardware, and only top-grade webbings for strength and durability. An excellent choice for low wind conditions and larger friends and family members or average weight people in light winds. Do not use in winds over 12 mph. Minimum of 90 HP boat required. 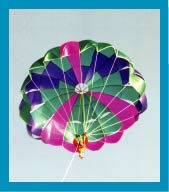 This package is an excellent choice for extremely low wind conditions with heavy single or two flyers. Do not use in winds over 12 mph. 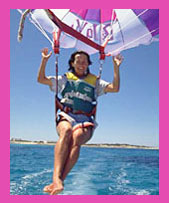 This package is an excellent choice for extremely low wind conditions with heavy single or two flyers. Do not use in winds over 12 mph. High Lift design. 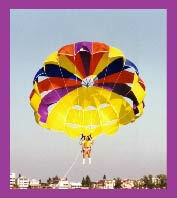 Your enjoyment of Parasailing can be enhanced with the use of exciting accessories listed below. Ask your Parasail Workshop Expert about adding these accessories to your package. As a safety precaution, always wear a life jacket when participating in water sports. 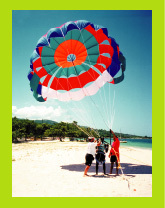 Quick Releases fit between the tow line and parasail and allow for floating to the water freely. Caution: Never use Quick Release with tension on the towline. 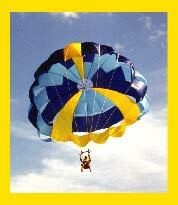 As a safety precaution, always wear a Helmet when parasailing. Indicates wind velocity accurately. Never parasail in winds over 15 mph. Indicates wind direction for precise parasail takeoffs. Call us and ask for a quote. Copyright © 20022015 Parasail Workshop, Inc., All Rights Reserved.